Terrible news out of Philadelphia, where an 18-year-old college student fell to her death from an eighth-floor apartment in Center City. She had apparently climbed onto a ledge to take photos when she slipped and fell. Rebecca Kim, a freshman at Temple University, was visiting friends at an Art Institute of Philadelphia dorm room on Thursday evening when she climbed out of a window onto a two foot wide ledge, possibly taking some pictures on her cell phone. It's believed Kim may have slipped as she was going back inside. Kim fell to the sidewalk, and was pronounced dead at the hospital. As she fell, she struck a 44-year-old woman who suffered multiple spine and rib fractures, and had some teeth knocked out. 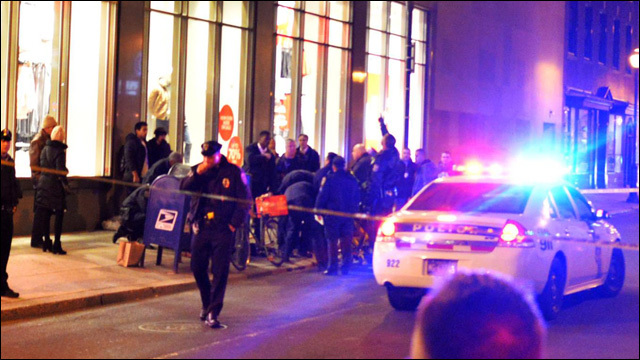 The 18-year-old woman was visiting male friends who resided in the building at 16th and Chestnut streets when she fell from an eighth-floor window shortly before 6 p.m. Thursday, also striking and critically injuring a pedestrian, according to police. Temple identified her as Rebecca Kim, 18, who graduated in June from Wissahickon High School in Ambler. Philadelphia police, who declined to name the young woman, said Friday she had been visiting the apartment, an Art Institute of Philadelphia dormitory, to take pictures from the window. When she climbed onto a ledge from a south window, one of the residents asked her to come back inside, he told police. The witness told investigators that the student tumbled from the ledge, and when he looked out the window, she was on the sidewalk. The investigation into the incident remains ongoing, but neither foul play nor suicide are suspected.